China just announced a mitigation goal to peak its emissions by 2030 or earlier, while the United States committed to reduce its national emissions by 26-28 percent below 2005 levels by 2025. South Africa has pledged to reduce its emissions 34 percent below business-as-usual emissions by 2020. Costa Rica has a carbon neutrality goal to be achieved by 2021. New York City aims to reduce its emissions 30 percent below 2005 levels by 2030. And countless other cities and countries have set similar emissions-reduction targets. The problem is that for some goals, the details of the design remain unclear (for example, at what level will China’s emissions peak? How will the United States track progress towards a range of possible emissions reductions?). And there is no methodology available for these jurisdictions to accurately and consistently measure whether they’re on track to reach this diversity of goals—until now, that is. 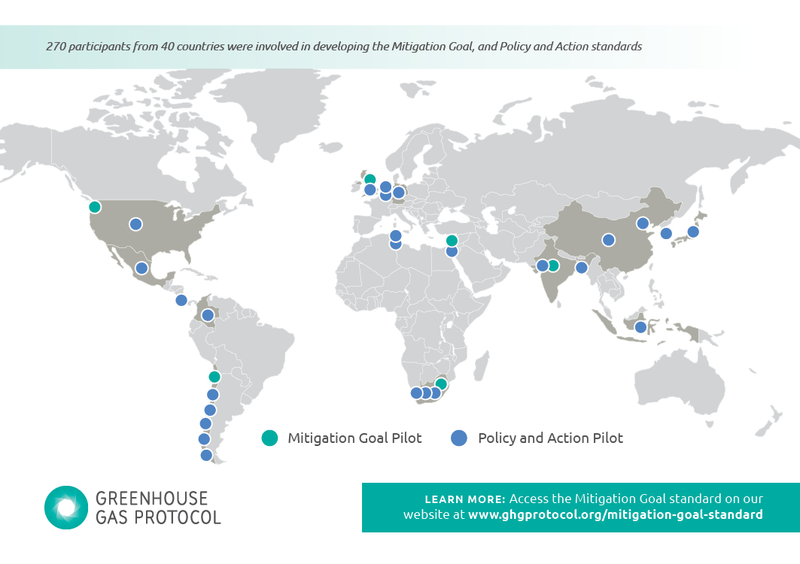 The Greenhouse Gas (GHG) Protocol’s Mitigation Goal Standard, launched today, provides the first-ever standardized approach for designing, assessing, and reporting progress on a variety of national and subnational mitigation goals. The standard can help governments set emissions-reduction targets, meet domestic and international emissions reporting obligations to groups like the UNFCCC, and ensure that efforts to reduce emissions are actually achieving their intended results. The standard is being launched along with the Policy and Action Standard, an accounting and reporting standard for estimating the greenhouse gas effects of policies and actions. Institutions in Chile, India, Israel, South Africa, the United Kingdom, and the United States have already pilot-tested the standard. Take South Africa: The national government set a target to reduce its mining sector emissions 15 percent below 2006 levels by 2015. Promethium Carbon, a carbon finance consulting group, used the Mitigation Goal Standard to see whether the country was on track to achieve this target. The group started with South Africa’s base-year emissions from the mining sector, which it calculated to be 10.68 megatonnes of carbon dioxide equivalent. By following the calculations set out in the Mitigation Goal Standard, the organization found that the sector will need to reduce its emissions by an additional 1.31 megatonnes of greenhouse gases—or about 12.6 percent below 2013 levels—to meet its 2015 goal. This evaluation gives the mining sector the information it needs to identify additional actions it can take to reduce its emissions and meet its goal. A forthcoming report underscores the urgency of a consistent framework for designing and measuring progress on mitigation goals. The UNEP Emissions Gap Report, an updated version of which will be released tomorrow, has repeatedly found a significant “emissions gap” between where global emissions are currently headed and where they need to be to have a likely chance of limiting warming to 2°C, thus preventing some of the more disastrous impacts of climate change. Part of the reason for this “gap” is that unclear assumptions and lenient accounting rules underlie some countries’ mitigation goals. It is our hope that this standard advances a more consistent, accurate and transparent method of designing and tracking progress, which can reduce uncertainty about future emissions levels. Following the launch, WRI will hold a series of training workshops on the standards—in Mexico, Colombia, South Africa, Ethiopia, India, and Thailand—between late 2014 and February 2015. For more information and to download the standard, visit the GHG Protocol website.